SESP sophomore Austin Gardner speaks during ASG Senate. The ASG vice president for accessibility and inclusion — who was also a candidate for executive vice president — resigned along with 14 other members of the A&I committee Wednesday. 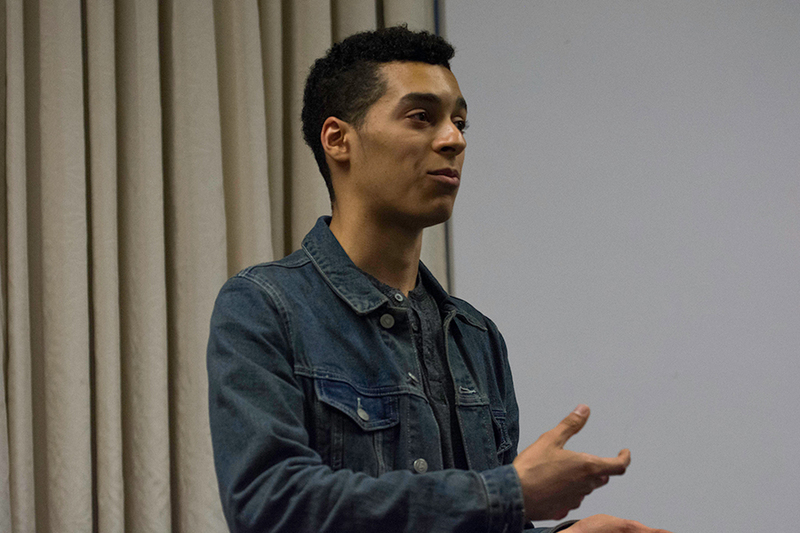 Associated Student Government vice president for accessibility and inclusion Austin Gardner and the entire A&I committee have resigned effective immediately, Gardner said during Senate on Wednesday. The committee made the decision following Weinberg juniors Sky Patterson’s and Emily Ash’s ASG election victory. Patterson and Ash narrowly defeated SESP junior Justine Kim and Gardner, a SESP sophomore, with 49.2 percent of the vote. Gardner announced his resignation shortly before Patterson and Ash were sworn in during Wednesday’s Senate. He and the other 14 members of his committee sent a letter — forwarded to The Daily — to former ASG president Nehaarika Mulukutla. In the letter, Gardner and the other students highlighted the initiatives they’ve taken over the past year, including a number of policies created by the trans rights subcommittee. According to the letter, the subcommittee’s initiatives included a trans sensitivity guide for professors and gender neutral housing. The letter also stated that Gardner’s predecessor, Jourdan Dorrell, warned him to be cognizant of ASG’s “history of maltreatment” regarding co-opting the work of other students. The committee members said that they believe Patterson and Ash took their work and presented it as their own, and that they also “erased” the work of the subcommittee members. “We just don’t feel comfortable moving into the current year with our leadership potentially taking our work,” Gardner said at Senate. The committee members said in the letter that they will continue to pursue advocacy and activism elsewhere on campus. In a message to The Daily, Patterson said that despite the resignations, she is excited to see what the A&I committee can do this year, and she wants each executive board committee to prioritize accessibility and inclusion policies. Patterson added that she had been looking forward to working with Gardner and building unity considering the contentiousness of the election. “Traditionally, the losing candidate has remained in ASG at least long enough to transition their successor and ensure their work continues, but we do understand Austin’s desire to step away after this stressful period,” she said.